Living in Munich means living in the most expensive city in Germany - the (usually) nice weather, the closeness of the Alps and the many beergardens and other available hedonistic pleasures make for extremely high rents and costs of living. I know many a gamer here who can't afford an apartment big enough to store his/her games! 'We don't usually like to do previews.' says Brunnhofer. 'Even if they are positive they tend to create a too high expectation that nobody can compete with, as was the case with "Euphrates & Tigris". Now E&T is considered a classic, but when it first came out there was a certain backlash to the immense hype that didn't make us happy'. But after promising to make this a descriptive preview instead of an evaluating review (the latter would be morally dubious anyway, as I was slightly involved in the playtesting of this game), Bernd was only too happy to indulge me in the secrets of this new and certainly interesting Kramer game. "Hazienda" takes place in Argentina, sometime between the 30's and 50's. 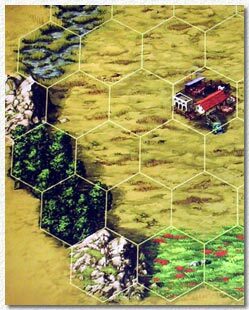 The players (2-5) represent land owners who want to get rich quick by establishing trade routes and accumulating acres of land. Earning and spending cash is an important motor of the game, but of course it is victory points that count at the end of the game, after all this is a game with the eponymous 'Kramer Leiste' (Kramer track) to keep track of VP! Each player starts with 20 bucks and a selection of animal and land cards. The board consists of a 'land track' with 5 different types of land surrounding the open 'Pampa' spaces so typical for Argentina. Appearing throughout the Pampa spaces are markets which players try to connect to their land spaces via 'animal routes'. Animals come in 4 different kinds, and have to be played as a match, so a pig trade route can only be lengthened by playing more pig cards on it. There are also water spaces (lakes) that accumulate victory points when the player owns adjacent animal or land tiles. There are two VP calculations in the game, one after half of the animal cards have been used up, one after all of them are in play, the latter situation ends the game. If all this sounds rather abstract it comes as no surprise. First of all this is a Kramer game (what do you expect? ), and even Brunnhofer makes it clear that 'this is certainly not an unconventional game'. But Kramer's designs are widely known for their durability and elegance, and so 'Hazienda' is certainly worth a closer look. In fact the options for the players are impressive - there are 3 actions per player turn, and they can be multiples of the same action and be done in any order. Haciendas can also be placed on animal lines, but this is done rarely. Another possibility is 'hugging' lakes with your animal or land lines. You can also cleverly create your own lakes (quasi godlike and slightly dubious from a realism point of view, but essential to the game. One could think of them as artificial water spaces created by dams). This also costs 12 bucks, and you should select a lake form that hugs as many of your spaces as possible as other players will also benefit from a lake placed next to their spaces, even if they didn't do it themselves. Connecting the markets is important in 2 ways: first of all each time an animal connects to a market (even if done several times in a circle by playing more and more of the same type of animal) you get the length of your land stretch plus the animal track in money. Get rich quick schemes are usually quickly thwarted by your opponents who can tactically place their tiles in your way to prevent a 'circle run' around a market. The second and more important function of markets is that they are a VP cash cow: the more different markets you connect yourself to the more VP you get, in an exponential curve similar to the game Hare and Tortoise. Another way to make cash is to harvest a stretch of land (this can only be done once per line) for 3 bucks per land space. Owning money is not bad either, as 10 bucks convert to 1 VP - in both VP calculations! These are, in a nutshell, the rules of the game, and they can be understood quickly by any kind of gamers. As is usual for this type of games you want to do many things at once but can only do so little in each turn. The road to victory is therefore to be as efficient as possible with your actions, by maximising input and output. Balancing the various VP requirements was therefore the most important task in the design work of this game, says Brunnhofer, who is an expert at removing unnecessary details to make the design as fluid as possible. Early versions of the game included, for example, many more options for earning VP's. One of them was the possibility to earn bonus VP's for the longest land line. 'We dropped this to eliminate the boredom of watching players constantly counting the length of their land lines, which bogged the game down immensely' says Brunnhofer. Another way of calculating VP's by multiplying them instead of adding them was also removed, because it ended in wildly differing sums which made close and more exciting finishes impossible. But there are also things which were added. 'The original design of Kramer had numbered spaces instead of different land types, because he wanted to avoid similarity to other games of this type. Playing land cards was done very differently, with the use of jokers and the possibility to look for certain numbers in the other player's hands. In the end we introduced the lands again because they added more flair'. Good idea, because otherwise "Hazienda" might have been confused as an Acquire variant, which it certainly isn't! Another later change (this time by Kramer himself) was to interrupt the otherwise continuous land track with Pampa spaces, which forces the players to buy Pampa cards and also makes Pampa cards more valuable when they appear. The prototype I played was the finished version ruleswise, but the game itself had not yet gone to the printer. This is usually done very shortly before the Essen fair, to give the possibility to change small details. Hans-im-Glueck is known to work hard on their rules to avoid any opaqueness or confusion, and even as we played our 3-player game Bernd Brunnhofer and Georg Wild made little notes for additional fine tuning. As the game is very dependent on an interesting map this comes in two versions, one 'symmetrical' and one 'asymmetrical', with the first one being recommended for beginners. As an additional service our own Guenther Rosenbaum from www.westpark-gamers.de has finished a special program that enables players to create any map they want from the original symbols and then print it out. Look for it now on our website or on the official Hans-im-Glueck website. "Hazienda" plays in 1-2 hours, and can be equally played aggressively (hindering other players from building good 'empires'), strategically (go for the markets to get a surprise VP rush) or tactically (just consider what is best for you each turn). Each of these options will tax your head without bursting it, as the game play is rather swift (which was not the case with the earlier versions, where too many options slowed the game down). It plays equally well with 3 or 2 players, with only slight modifications in the distribution of cards. 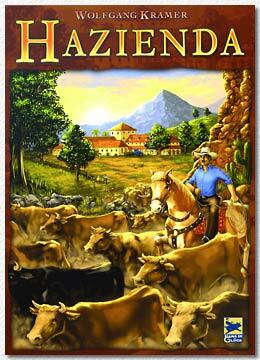 I predict that "Hazienda" will be a welcome new addition to the already impressive line of Kramer games. 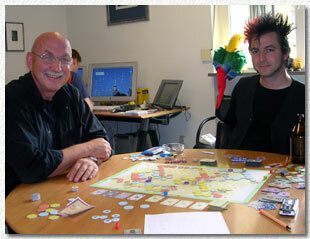 But don't believe my hype - join Hans-im-Glueck in Essen to see the finished game or play the game when it's available. Although none of us would probably mind another Euphrates & Tigris - hype or no hype.